Borussia Dortmund picked up the first points of their Bundesliga campaign with a 3-2 win away to FC Augsburg. Jürgen Klopp’s side clearly dominated the first half and could have ensured victory with a little more ease, but conceded two goals in the last ten minutes of the match. Just three changes were made from the Dortmund line-up involved in the defeat against Leverkusen one week ago, with left winger Kevin Großkreutz in for centre-forward Ciro Immobile, while Roman Weidenfeller and Neven Subotić replaced Mitchell Langerak and Matthias Ginter. As a result, Klopp changed the basic formation. Dortmund mostly played in a 4-1-4-1 instead of a 4-3-1-2. That 4-1-4-1 often became a 4-5-1 defensively with a compact line of five behind Pierre-Emerick Aubameyang. Augsburg coach Markus Weinzierl made only one change, with Shawn Parker replacing Caiuby as the right winger in the typical 4-1-4-1. Augsburg, however, mostly appeared in a 4-2-3-1 or 4-2-4 as Markus Feulner dropped deep alongside the great Daniel Baier. The Bavarians started well and made it difficult for Dortmund’s build-up play. Augsburg came out in a 4-2-3-1 formation with Parker und Tobias Werner on the wings moving inside. 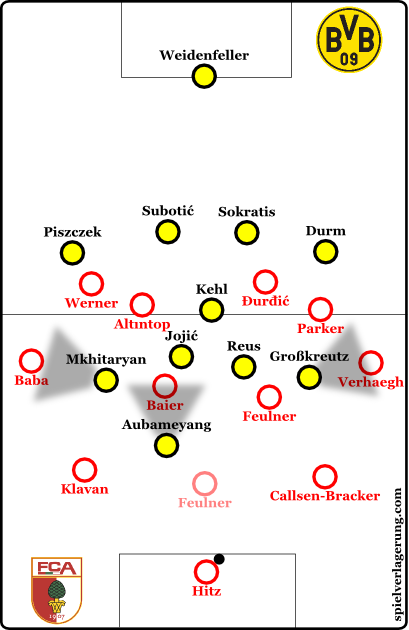 Baier played as the true playmaker a half-left eight position, while Feulner as the originally right eight often dropped between both centre-backs, with Altintop playing higher in the left half-spaces. Abdul Rahman Baba played with Paul Verhaegh as the fullbacks and both pushed high up the pitch and stretched the field horizontally in the initial build-up phase. The lone centre-forward Nikola Đurđić attempted to position himself between Subotić and Sokratis or he dropped deeper and linked up with his teammates, while he received a couple of vertical passes out of the back-line. With the passing of time, Feulner moved higher up the pitch and was not any longer actively involved in the initial build-up. Jan-Ingwer Callsen-Bracker and Ragnar Klavan tried to play the first passes properly, but both struggled with Dortmund’s rhythm changes and the situational high press. The movements of the wingers off the ball were especially interesting. The near-ball player stood a bit deeper to find some open space and attempted to receive a pass, while the far-ball winger stood a bit higher and provided width on his side. When Augsburg’s centre-backs switched flanks, Werner and Parker immediately switched their orientation. Dortmund’s 4-1-4-1 seemed to be perfectly balanced after the first spell. Klopp’s side started off nervously and they repeatedly gave the ball away, but were settled down once Reus got the first goal of the night. After eleven minutes, Mkhitaryan played the ball inside; Reus received it in front of the penalty box. He waited until Verhaegh approached him before laying off the ball to Großkreutz and running past the Augsburg right-back. Großkreutz immediately gave Reus the ball back and he rode past Callsen-Bracker and scored subsequently. Only four minutes later BVB doubled their lead to. A corner was converted with a header by Sokratis. The midfield line of four was very fluid and Dortmund’s attacking players searched for many 1v1s as Augsburg struggled with the pace of the away side. Dortmund displayed some rhythm changes in terms of their pressing structure. Either Reus, Aubameyang and Miloš Jojić pressed high up as a line of three, while Mkhitaryan and Großkreutz drifted inwardly to form a 4-3-3, or Dortmund stood compactly in a 4-5-1. The latter was characterized by the movements of Aubameyang and Reus. The Gabon tried to cover Baier in his shadow, while Reus chased Feulner or sit alongside Aubameyang to provide locally compactness. Kehl sometimes moved between Jojić and Reus in passive phases. Weinzierl used the forward movements of his two full-backs to produce a 2-4-4, but there was a lack of ideas in possession of the ball. Consequently, Augsburg did not gain space in the attacking third. BVB cut off the passing channels, and based on good anticipation and coverage shadows the Schwarzgelben intercepted many balls. Moreover, Dortmund’s players were very calm with the ball on their feet and could manage the transition play very well during the first half. The away side merely were not relentless enough in converting the goal scoring opportunities. After the half-time break, Augsburg’s attacking play seemed to be more fluid. They moved better and could pick up some lose balls. Weinzierl instructed to change the attacking rhythm. The home side turned to flank play to gain advantage over Dortmund. Furthermore, they played many flank shiftings. It normally is hard to find success with this strategy against Dortmund. The Schwarzgelben move so consistently and remain compact in the middle of the pitch. However, BVB showed a lack of aggressivity and Augsburg tried to outmuscle Klopp’s side. Though the wide parts of the field served as a likely point of attack, Augsburg is lacking one of their main weapons in position of a far winger: André Hahn. It was obvious, Weinzierl’s team is missing the diagonal runs and penetrating power of Gladbach’s summer signing. After an hour, the major change was Klopp switching shape, and moving to a 4-2-3-1. It made sense for him to become more cautious with an extra holding midfielder considering the pressure of Augsburg’s attacks. Sven Bender replaced Jojić, Reus moved centrally and now Dortmund were doing a much better job of knocking off the ball. Meanwhile, Weinzierl made subtle changes. Firstly, Raúl Bobadilla replaced Parker and bombed forward much more down the right. Secondly, the Augsburg coach turned to Tim Matavž in place of Feulner, but also changed the formation to a 4-4-2, with Altintop switching to right centre midfielder role. 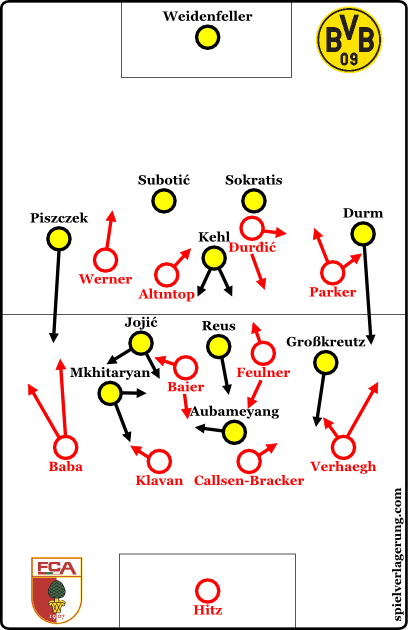 In the centre of the offensive – with Dortmund now unquestionably a 4-2-3-1 – Großkreutz was removed and Klopp went for Adrian Ramos, a better option than Ciro Immobile at this moment, to shield the ball in the opposing half. Despite being 2-0 up Dortmund still looked vulnerable. The defence played a very high offside line that was caught out on multiple occasions in the second half. Then in the 75th minute, however, Aubameyang won a corner that was initially dealt with by the defence, but it fell to Mkhitaryan whose shot was blocked by Hitz, but the resulting rebound was tapped in by Ramos. Though only four minutes later Bobadilla controlled a brilliant cross from left full-back Baba and lifted the ball over the diving Weidenfeller. After 89 minutes, Baba again sent in another cross that was converted by Matavž with a header. Augsburg eventually were unable to grab an equaliser in the final minutes. Klopp clearly was not happy with last week’s performance against Leverkusen, but strategically they did nothing particularly exciting. It was the standard Dortmund blueprint. They were superbly dynamic on the breaks; with Reus and Mkhitaryan they have the quick passing combinations and diagonal runs in counterattacks or transition play. 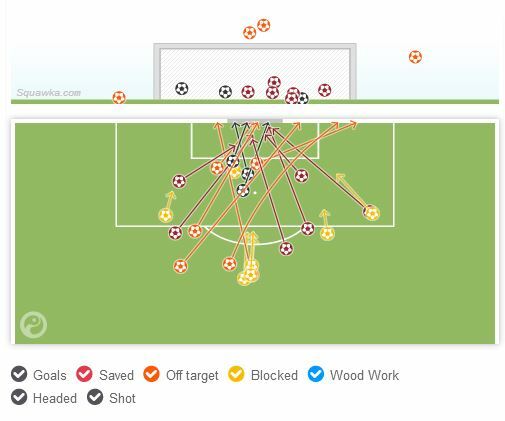 Meanwhile, Augsburg struggled with their own build-up play and with a Dortmund team constricting the space. Klopp’s side played a very high back line. Therefore, the distance between both Dortmund’s and Augsburg’s centre-backs was short. The Swabians consequently were not able to find Baier properly in the middle of the pitch or to involve both full-backs. Baba as well as Baier or Altintop stayed in dead spaces most of the time. Anyway, Augsburg fought back and profited by a sloppy Dortmund team. It might be only human that concentration rates drop when owning a comfortable lead, but Dortmund’s defensive behaviour was utterly shambolic, and luckily for Dortmund they did not concede a third goal.